Like most every other estate in Burgundy, it used to be a lot bigger. Family splits and inheritance laws keep whittling away at family vineyard holdings on the Côte d’Or - the average estate today is about 15-17 acres. Domaine Bertrand et Axelle Machard de Gramont traces it’s origins to Domaine Chantal Lescure, which had an impressive 79 acres of vines in the 60s and 70s. One of Bertrand’s two brothers was married to Chantal, so the Gramonts and Lescures combined their holdings into one estate.Then in 1984 Bertrand’s brother and Lescure divorced, and his mother passed away - so each of the stakeholders decided to go their separate ways. The result was three new domaines - Chantal Lescure, Domaine Marchard de Gramont, and our new Caveau family member - Domaine Bertrand Machard de Gramont - taking just under 15 acres in the Côte de Nuits with him for the new venture. Bertrand’s daughter Axelle joined the estate in 2004, and her name was added to the label as of the 2015 vintage. Bertrand started his career in the cellar at the legendary Domaine Comte Georges de Vogüé in Chambolle-Musigny, where he learned to love wines of elegance and finesse. When he started his own domaine, there were some 5 acres of his vineyard holdings that were not planted - high on the slope atop the extreme southern end of the Nuits-St. Georges appellation, a lieu-dit named Les Vallerots. There had been vines there prior to phylloxera, but everything was ripped out at the end of the 1800s. Between the two World Wars people had attempted to replant there, but the project was started and then abandoned multiple times. Finally Bertrand planted it in 1984. Then in 2001 he took on the massive job of removing trees and boulders from the highest portion of his parcel and planting on the steep, thin soils there. This parcel is now called Les Terasses des Vallerots, and it produces a wine of extreme refinement and purity. His daughter Axelle joined her dad in 2004, and has been the driving force in converting the estate to organic viticulture with a focus on lower yields. She also seems to have the elusive “magic touch”, as her wines started taking huge leaps in quality by 2010. Interestingly, it was Axelle's sister who was scheduled to take over the estate, but she got cold feet at the last minute. Axelle jumped in to help out of necessity, and soon fell in love with life of a vigneronne. The winery is located way up in the Hautes-Côtes de Nuits in the tiny hamlet of Curtil-Vergy, and sits directly below the historic Abbey of Saint-Vivant, which dates to the 800s. 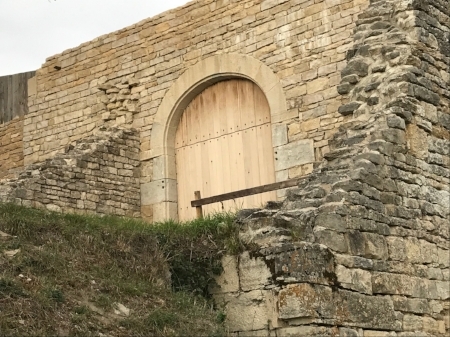 The monastic order was the original owner and developer of what is now called Romanée-St. Vivant, among many other vineyard holdings The abbey has been recently bought and is being renovated by DRC and has been designated a historic monument. Bertrand is now 75 and still active, but it is Axelle who is firmly in control and responsible for the gorgeous quality of her wines. She works with prime holdings in Nuits-St. Georges and Vosne-Romanée, and a very special parcel of heirloom Aligoté behind the abbey. We’re immensely proud to welcome Axelle and her wines into the Caveau family as of 2018!